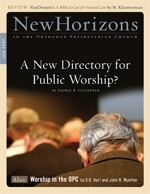 A New Directory for Public Worship? The Seventy-fourth General Assembly (2007) marks the climax of a task that has been under way in the Orthodox Presbyterian Church for almost six decadesthe revision of what we now call our Book of Church Order (BCO). In June the Committee on Revisions to the Directory for Public Worship will submit its Amended Proposed Revised Version (APRV) of the Directory to the General Assembly for approval. If approved, it will then be sent to the presbyteries for ratification. The Orthodox Presbyterian Church was born in 1936 from a doctrinal controversy. As J. Gresham Machen and his allies escaped from the modernism of the mainline Presbyterian church into "a true Presbyterian church, at last," there was much work to be done in establishing the doctrine and practice of the new denomination. The church began by debating which version of the Westminster Confession of Faith should be adopted as part of the church's constitution. In 1937 the General Assembly determined to eliminate the compromising amendments of 1903. People who inquire about a church often ask, "Is your worship contemporary or traditional?" Whenever I hear that, I feel like the guy who's just been asked, "Are you still beating your wife?" How can you answer a question like that? It starts with wrong assumptions. It's the wrong question! It misses the real point of worship. Most discussions of worship today focus on style: contemporary or traditional? But while the church has been fighting over worship style, she seems to have forgotten what worship is all about. As our theology of worship has disappeared, it is perhaps not surprising that our practice of worship has become so fragmented.